right to housing – We need a national housing strategy now! We have an affordable housing and homelessness crisis in Canada and the government is doing little to fix it. The Advocacy Centre for Tenants Ontario (ACTO) and the Right to Housing Coalition are joining groups and individuals across Canada in a national week of action. Make affordable housing an election issue and vote housing for all! 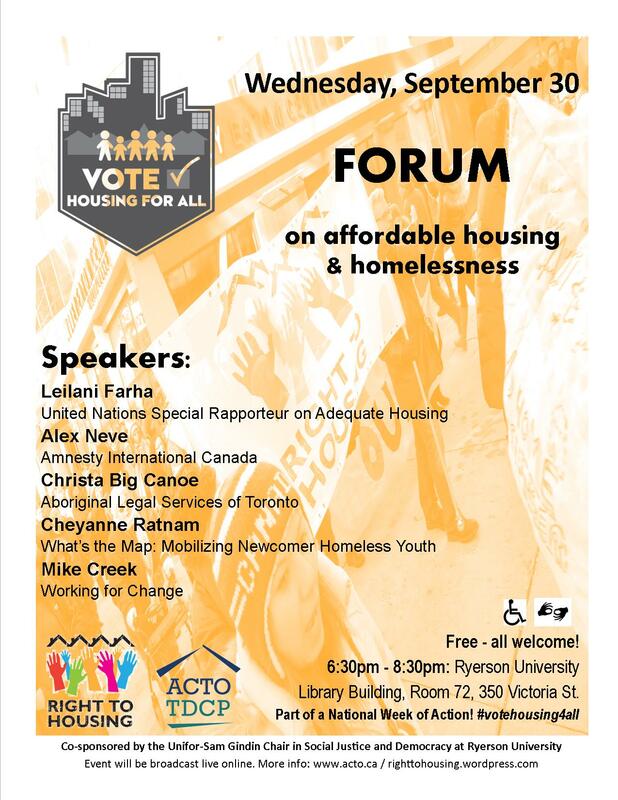 Join us for our Right to Housing Forum to talk about the affordable housing and homelessness crisis in the context of housing as a right. THIS EVENT IS FREE! ALL WELCOME! The forum will also be broadcast live online here. Invite your friends and share our Facebook event page here. Co-sponsored by the Unifor-Sam Gindin Chair in Social Justice and Democracy at Ryerson University. As the October 2015 federal election approaches, send a strong message to all political parties: we want a national housing strategy now! This event is part of a national week of action, Sep 23rd-30th. For more information: https://righttohousing.wordpress.com/take-action. 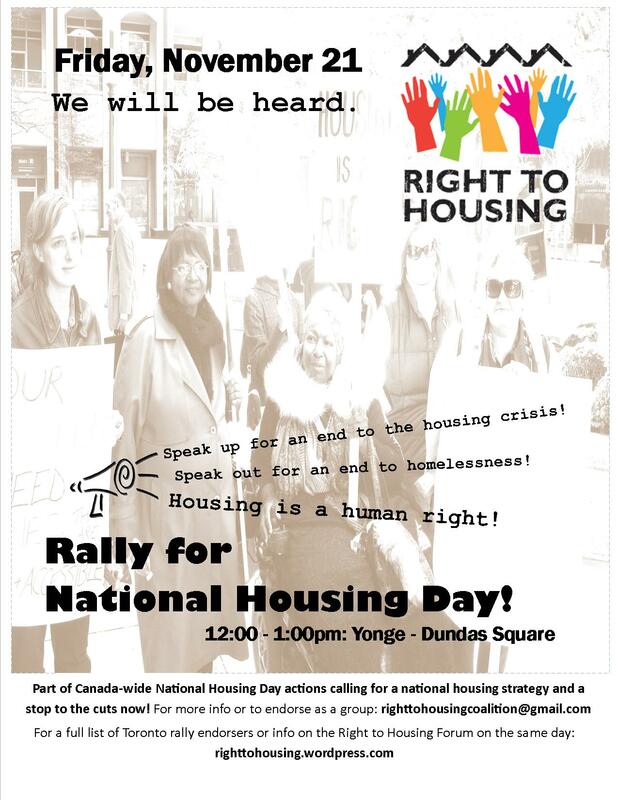 Toronto: RALLY for National Housing Day! We have a housing and homelessness crisis in Canada. November 21st: We will be heard. Speak up for an end to the housing crisis! Speak out for an end to homelessness! The Toronto rally is part of a National Day of Action taking place across Canada to send a message to the Federal government that we are calling for a national housing strategy and a stop to the cuts now! For more information or to endorse the rally as a group or organization: righttohousingcoalition@gmail.com. Don’t forget to join us at our Right to Housing Forum after the rally! The homelessness crisis may soon get even worse. In Canada, 365,000 low income households are at risk of losing their homes because the Federal government refuses to renew subsidies for social housing. Meanwhile, the waiting list for social housing continues to grow: there are over 165,000 households on the waiting list in Ontario alone. In 2009, Miloon Kothari, the UN Special Rapporteur on Housing, called the housing and homelessness crisis in Canada a “national emergency.” Yet, Canada remains the only G8 nation in the world without a national housing strategy, and our government continues to cut funding to housing and homelessness programs. Join us on November 21st as we raise our voices collectively to say enough is enough! For a list of sources for the figures mentioned, please visit this page. On social media? 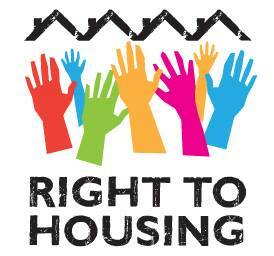 Use the hashtag #right2housing on Nov 21st to join in the conversation! Join us on Facebook here and help spread the word by inviting your FB friends! Don’t forget to join us at our Right to Housing Forum after the rally – see the event page here. Today, formerly and currently homeless Ontarians launched a landmark legal challenge against the federal and provincial governments. Joined by housing advocates and their lawyers, the individuals are seeking a Court declaration that Canada and Ontario have violated their rights under section 7 and section 15 of the Canadian Charter of Rights and Freedoms by creating and maintaining conditions that lead to and sustain homelessness and inadequate housing. The Applicants’ lawyers will argue that both the Charter and international law require that Federal and Provincial governments implement effective housing strategies that will reduce and eventually eliminate homelessness and sub-standard living conditions. For more information, read the related press release at this link. Please also visit this link to read a related Globe and Mail article. Or you may wish to listen to an interview on CBC Metro Morning with Peter Rosenthal, one of the lead counsel in the Charter challenge, at this link.